By Styles Cradgerock,WASHINGTON – Vital edutainment from U.S. President Barack Obama’s speech last night, confirming the death of Osama bin Laden was accidentally left on the White House cutting room floor, The Brutal Times has learned. The following is a Director’s Cut of the entire speech, with the president’s original 2008 campaign personality faithfully reassembled by fans old enough to remember. Camera opens on empty Presidential lectern in darkened White House hallway. President Obama appears, looking serious. My fellow Americans, good evening. 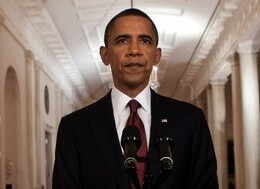 Tonite, I have the pleasure of telling you Osama bin Laden is dead, killed by U.S. troops in Pakistan, at my direction. Our collective unconscious nightmare has come to an end. I was supposed to come on CNN at 10:30 pm. First Yahoo offered a teaser, saying I would announce “something”, but offering no details. Then CNN ratched up the suspense with a black screen on the Internet, with no image or sound. Never before has someone been able to command the attention of a live TV audience and the global Internet in such a manner. It gave you the same feeling as waiting for Guns N’ Roses to come on, or, if you’re old enough, the Stones, back in the day. At this point, you’re feeling strongly that this speech should have been historic. I understand that. Much like President Bush’s March 19, 2003 speech to the nation, in which he justified his decision to invade Iraq, this speech, by definition of its content, is historic. It could be that my voice, much like Bush’s back then, is stilted, and zombie-like. It could be, that like Bush’s speech in 2003, I am making this speech in an election year – Bush, you’ll recall, was also not doing so hot in the polls until he announced his decision to whack Saddam. But most of all, it’s probably because, you expected more from me. More from me than similarities to George W. Bush. If you supported me in 2008, you feel I sold out and became another Bill Clinton. Although I promised change, I’m either too afraid of the Republicans, despite the overwhelming support I got from the American people to wipe the floor with Bush’s policies; or I was bullshitting you all along, and I was never that much different from any other politician. Those of you who believe the last one – see me on the golf course, later. So, I – hold on, hold on – I promise I’ll get back to Bin Laden later – I feel your pain. The thing of it is, is, we know you who supported me in 2008 aren’t gonna vote for The Donald, and there’s no younger, more vibrant, energetic, honest-looking leader in sight on the Democratic side. So, if you vote, and you’re against Donald Trump, you’re gonna vote for me. Unless…you don’t vote at all, and then The Donald…actually has a chance at winning. But let me get back to Osama bin Laden. Before I go, I want to remind the American people that America is not, and has never been, at war with Islam. And if you believe that, I respectfully ask for your vote again next fall. By all rights, tonite’s speech should have been a celebration. Instead, it feels like a campaign rally, and something eerily set designed to set the stage for yet another long walk down the deep, dark, unconvinced corridor of your unconscious. Good night, America, and sweet dreams. This entry was posted in Presidential Daily Brief and tagged barack obama, george w bush 2003 iraq invasion speech, obam's bin laden is dead speech: the director's cut, osama bin laden, Presidential Daily Brief, styles cradgerock, the brutal times. Bookmark the permalink. cripes, they caught bin laden? i can’t – wait, i’m already getting used to – now i’m bored already. i’m old enough to remember obama, but i’m not old enough to remember anything he says.